Today was Day #3 of Chocolate and Hawaii/Islands Theme Week. I continued to work my way through an exotic caramel assortment box from Vosges (Chicago, IL). 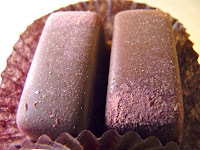 Today's Blush caramel contained Hawaiian red sea salt in the caramel, and the chocolate covering was sprinkled with Li Hing powder -- that provided a pink blush color as well as a slightly tart, fruity taste. These Vosges caramels offer layers of identifiable flavors like (rather than one homogeneous mixture), so that each flavor has a turn to shine for a few seconds.